The management of myasthenia gravis (MG) during pregnancy requires special skills as both diseases as well as its treatment can have deleterious effects on mother and fetus. MG often affects women in second and third decades of life during the childbearing age. Exacerbations of MG are likely to occur during the first trimester and postpartum period. The treatment of MG during pregnancy needs to be individualized depending on the severity of MG as well as the efficacy of various treatment modalities and their possible harmful effects on pregnancy. In addition, special attention has to be given to avoid drugs and other factors (such as urinary tract infections) which may worsen MG. The key to successful outcome during pregnancy in myasthenic women lies in multidisciplinary care involving obstetricians, neurologists, anesthetist as well as neonatologist. In this review, we discuss various therapeutic options available for the management of MG during pregnancy and provide recommendations based on the current best evidence. Myasthenia gravis (MG) is an autoimmune disorder of neuromuscular junction (NMJ) with a prevalence of 150–250 per million. It is characterized by weakness of skeletal muscles due to damage inflicted to NMJ by autoantibodies directed either against acetylcholine receptors (AchRs) or other functionally related molecules on the postsynaptic membrane., Although a commonly reported neurological disorder during pregnancy, there are controversies surrounding optimal management of MG in pregnancy. In this review, we discuss management of MG during pregnancy. As MG commonly affects women of childbearing age, it is not uncommon to encounter a pregnancy complicated by MG. The effects of pregnancy on the severity of MG are variable. In one study, while 30% of patients did not show any change in the status of MG, 29% reported improvement and 41% reported worsening of myasthenic symptoms during pregnancy. Worsening of myasthenic symptoms was usually seen during 1st trimester and in 1st month following delivery while the improvement of myasthenic symptoms was reported during 2nd and 3rd trimesters likely related to pregnancy-induced immunosuppression which occurs during these trimesters.,, The main causes of exacerbations of MG during pregnancy include: (a) hypoventilation due to weakness of respiratory muscles and elevation of diaphragm during pregnancy, (b) puerperal infections, (c) drugs, as well as (d) stress of labor and delivery. A factor which may be predictive of maternal mortality due to MG itself is the duration of MG before index pregnancy. In one study, the risk of maternal mortality was highest during the 1st year after diagnosis of MG and minimal 7 years after diagnosis of MG. However, in general, long-term outcome of MG is not reported to be altered by pregnancy., Furthermore, clinical severity of MG at onset of pregnancy does not predict its course during pregnancy and behavior of MG during index pregnancy does not predict its course during future pregnancies. The optimal management of MG during pregnancy requires a multidisciplinary team approach comprising obstetrician, neonatologist/pediatrician, and neurologist with active contribution by the patient and her relatives. All women with MG who are planning pregnancy should be counseled about the possible effects of MG on pregnancy and vice versa. As far as possible, women should be involved actively in treatment decisions. The possible nature of treatment required as well as chances of adverse effects on fetus should be explained in detail. The nature of treatment regimen chosen should be guided by the severity of MG with special attention to bulbar or respiratory symptoms. Timing and frequency of antenatal visits in pregnant women with MG should be guided by clinical status of MG and nature of rituximab. While women in clinical remission can be followed less frequently, those who continue to be symptomatic should be followed frequently preferably once every 2 weeks during the first two trimesters and once every week during 3rd trimester. Women should be advised to count fetal movements and report to the treating physician/obstetricians if they feel that fetal movements are decreased. The timing and frequency of ultrasonography (USG) for fetal well-being is again dictated by clinical status of mother and chances of teratogenicity which is dictated by nature of drugs being administered for MG. In general, USG is carried out frequently in pregnant women with MG to look for fetal well-being and hydramnios. USG is performed even more frequently during MG exacerbations to look for any signs of fetal hypoxia. Women should also be screened frequently for asymptomatic bacteriuria and any infection should be treated promptly as it might worsen MG. In addition, all the women should undergo periodic detailed assessment of motor power, respiratory and cardiovascular status as well as thyroid function tests. Several drugs which are used for infections or otherwise during pregnancy may be associated with myasthenic exacerbations. 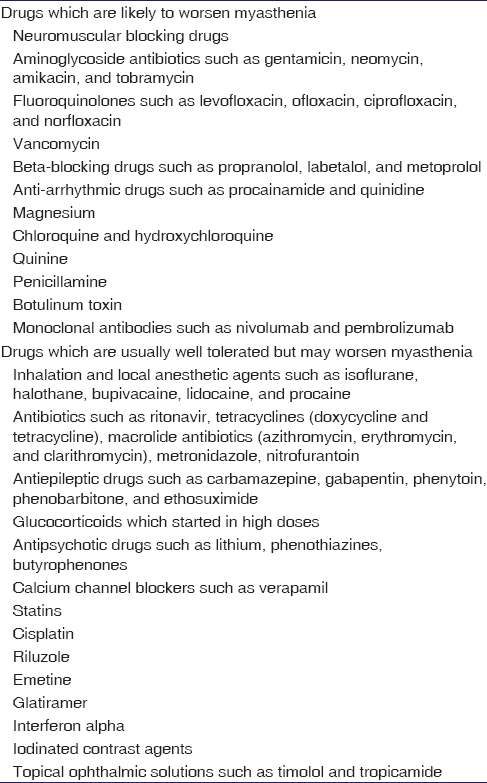 A complete list of all drugs [Table 1] which can worsen MG should be handed over to patients or their relatives. Pregnant myasthenic women should be advised to avoid exertion and take frequent rests. They should be advised potassium-rich diet and avoid undue emotional stress and lack of sleep. The mainstay of treatment in MG includes drugs (pyridostigmine and neostigmine) with inhibit acetylcholinesterase enzyme for symptomatic relief as well as corticosteroids and alternate immunosuppressant drugs (methotrexate, azathioprine, mycophenolate, cyclosporine, cyclophosphamide as well as pulse intravenous immunoglobulins). Severe exacerbations or myasthenic crisis require either plasma exchange or intravenous immunoglobulin with supportive care including ventilator support if required. The choice of treatment is dictated by clinical severity of MG and risks of therapy. For instance, a patient with ocular MG and few symptoms can be successfully managed with pyridostigmine alone, while a patient with generalized MG needs immunosuppressive therapy. Several studies have shown that pyridostigmine is safe during pregnancy in recommended doses (30–60 mg every 4–8 h).,, This drug crosses placenta freely and achieves good concentrations in amniotic fluid. Dose and frequency of administration often need to be changed during pregnancy due to changes in blood volume and renal clearance and should be adjusted according to the clinical status of MG. It may range from small dose such as 30 mg administered on an as and when required basis to frequent administration of large doses. Intravenous anti-cholinesterase inhibitors should be avoided during pregnancy as these can induce uterine contractions. Steroids continue to be the most commonly used immunosuppressive agents for the treatment of MG. Their use appears to be safe during pregnancy except for slightly increased (<1%) risk of cleft palate (OR = 2.74, 95% CI 0.96–7.82). Other side effects reported with the use of steroids include premature rupture of membranes and premature delivery, weight gain, and cushingoid appearance.,,, As withdrawal of steroid may lead to exacerbation of MG, pregnant women who are on steroids should continue steroids during pregnancy. However, for women who are not on steroids, one can withhold temptation to start steroids during 1st trimester as palate is completely formed by 12 weeks. A decision on the timing of steroid therapy should be taken only after due consideration to myasthenic status of the woman. Steroids should be started at a low dose and increased slowly as 33% of MG patients show worsening of myasthenic symptoms if started with high dose steroids from the beginning. A typical regimen is to start with 5 mg prednisolone once daily and then increase by 5 mg every 5–7 days till target dose is achieved (usually 0.75–1 mg/kg body weight). There are no guidelines for the optimal dose of steroids during pregnancy, and thus, the optimal dose of the steroid during pregnancy should be guided by clinical response with clear-cut aim to use the lowest possible effective dose during pregnancy. Although reported to cross placenta and associated with transient neutropenia, lymphopenia, and thrombocytopenia as well as prematurity, intrauterine growth retardation and abortions, use of this drug is not associated with any serious harm to the fetus., Most of the data regarding the use of cyclosporine in pregnancy are obtained from transplant recipients and other autoimmune diseases rather than MG per se. However, the current literature suggests that this drug can be used in pregnancy provided the perceived benefits to mother outweigh the perceived risks to fetus. The usual starting dose is 1.25 mg/kg body weight twice daily which can be increased by 0.5 mg/kg at 4–8 weeks interval up to a maximal dose of 4 mg/kg/day. Authors do not have any personal experience of the use of this drug in pregnant women with MG. The current evidence suggests teratogenic effects (short fingers and toenails, cleft palate and lip, and corpus callosum agenesis) as well high rates of spontaneous abortions following the use of mycophenolate during pregnancy. Thus, the use of this drug is contraindicated during pregnancy and recipients of mycophenolate should practice contraception during and for 6 weeks after discontinuation of this drug.,, The use of methotrexate during pregnancy is associated with high risk of neural tube defects including anencephaly as well as high rate of abortions. Thus, the use of methotrexate during pregnancy is contraindicated, and women who are on methotrexate should practice contraception.,, Similarly, the use of cyclophosphamide during pregnancy is associated with major congenital malformations, and this drug should be avoided in pregnant women. This drug is being used with increasing frequency in the management of MG especially severe MG and MuSK antibody positive MG. Although reported to cross placenta, use of this drug has not been reported to have major fetal adverse effects other than transiently decreased B-cell counts., However, experience regarding the use of this drug in pregnancy is still limited, and it should be used only when perceived benefits to mother outweigh perceived risks to fetus. Frequent USG for fetal well-being may be recommended whenever this drug is used in pregnant women with MG. Both these treatment modalities provide a prompt though short-lived response in MG and are recommended for the management of myasthenic crisis as well as impending crisis. Although associated with occasional side effects, both these treatment options can be administered during pregnancy with careful monitoring both mother and fetal well-being. While women who receive plasma exchange should be carefully monitored for hypovolemia, women receiving intravenous immunoglobulins should be monitored for hyperviscosity syndromes. The effects and safety of various medications commonly used in the management of MG during pregnancy is outlined in [Table 2]. During labor, epidural analgesia should be used to relieve pain. The use of narcotic and neuromuscular blocking agents should be avoided. Local anesthetic agents should be avoided if possible as these can block neuromuscular transmission. Nondepolarizing neuromuscular blocking drugs should be avoided. Sedatives and opioids should be avoided as these may precipitate respiratory depression. If these drugs are needed, women should be monitored aggressively for respiratory functions. Women who are on chronic low dose steroids may be given stress dose of hydrocortisone during intrapartum period. If required cholinesterase inhibitors can be used parenterally (preferably neostigmine). In preeclamptic and eclamptic women use of magnesium sulfate should be avoided as it can interfere with neuromuscular transmission by blocking release of acetylcholine.,,, Methyldopa and hydralazine are drugs of choice for treating severe hypertension in pregnancy. Maternal AchR antibodies can cross placenta and induce transient muscle weakness in 10%–20% of neonates born to myasthenic mothers. Thus all infants born to women with MG should be observed carefully for any signs of muscle weakness including bulbar and respiratory muscles. Although reported to reverse within 3 weeks, this syndrome has been reported to last for as long as 4 months.,, There is no correlation between the occurrence of neonatal MG and maternal antibody titers as well as the severity of MG in mother, and thus, it is impossible to predict likelihood of neonatal MG in an index woman. Treatment usually includes administration of cholinesterase inhibitor drugs. Rarely ventilator support or even small volume plasma exchange may be required. Other complications which are rarely reported in infants born to myasthenic mothers include pulmonary aplasia and arthrogryposis multiple congenita (AMC). The former results from lack of diaphragmatic movements (required for normal lung maturation) due to passive transfer of AchR antibodies to neonates while the later results due to decreased limb movements again due to passive transfer of maternal AchR antibodies to neonates., A positive correlation has been reported between maternal AchR antibody titers and occurrence of AMC in neonates. Polyhydramnios may result in mother due to impaired fetal swallowing. All the pregnant women with MG (even those without clinically significant MG) should be counseled against the possibility of these two complications. Transient hyperbilirubinemia is another complication may occur in neonates born to myasthenic mothers likely related to use of prednisone and pyridostigmine during pregnancy. Corticoids and anticholinesterase inhibitors are relatively safe in breastfeeding. On the other hand, other drugs such as azathioprine, mycophenolate, cyclosporine, and cyclophosphamide are excreted in breast milk and breastfeeding should be avoided in patients taking these drugs. 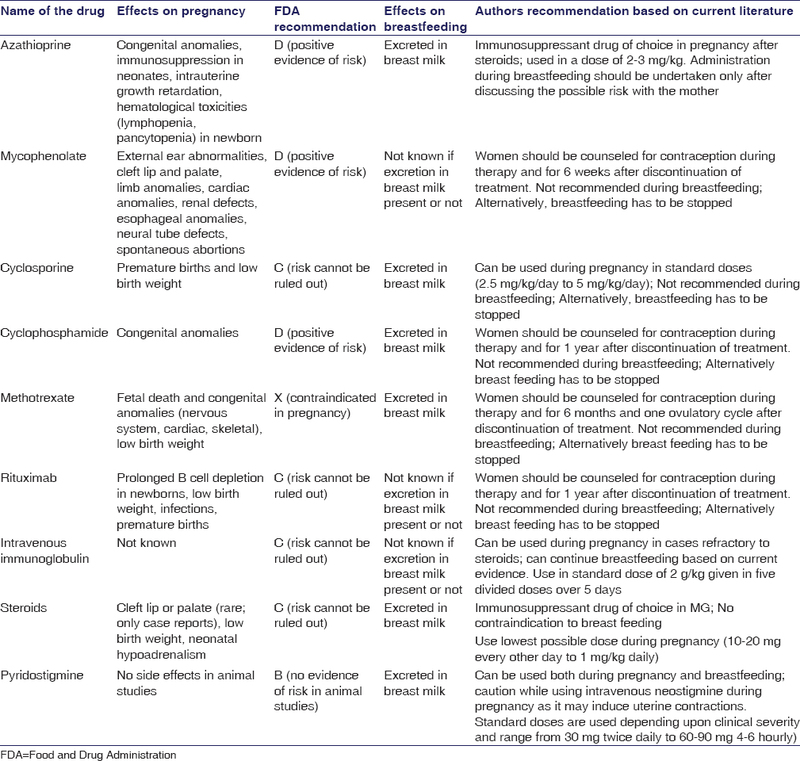 The current status of various drugs during pregnancy and breastfeeding is summarized in [Table 2]. Most of the myasthenic women can have uneventful pregnancy with good outcomes. Careful planning of pregnancy and a multidisciplinary team approach with careful attention to maternal and fetal well-being is the key to the successful outcome. 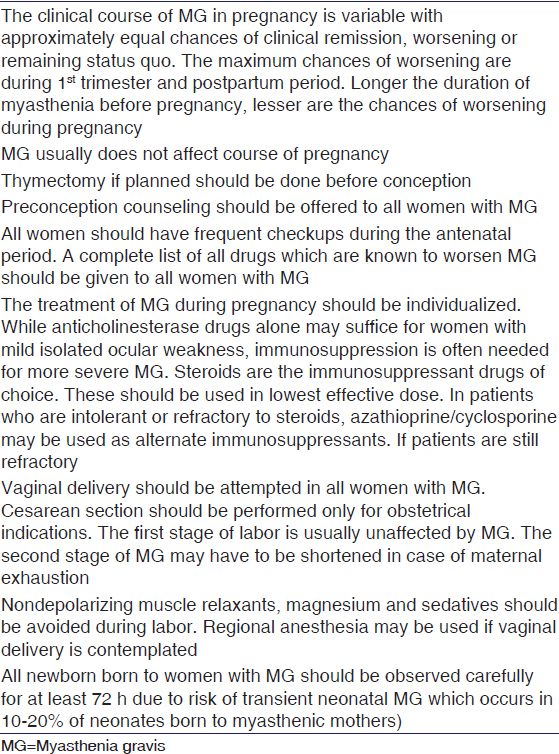 The summary of recommendations for the management of MG during pregnancy is given in [Table 3]. Gilhus NE. Myasthenia gravis. N Engl J Med 2016;375:2570-81. Carr AS, Cardwell CR, McCarron PO, McConville J. A systematic review of population based epidemiological studies in myasthenia gravis. BMC Neurol 2010;10:46. Ferrero S, Esposito F, Biamonti M, Bentivoglio G, Ragni N. Myasthenia gravis during pregnancy. Expert Rev Neurother 2008;8:979-88. Ferrero S, Pretta S, Nicoletti A, Petrera P, Ragni N. Myasthenia gravis: Management issues during pregnancy. Eur J Obstet Gynecol Reprod Biol 2005;121:129-38. Da Silva FC, do Cima LC, de Sa RA. Myasthenia gravis and pregnancy. In: Minagar A, editor. Neurological Disorders and Pregnancy. Burlington, MA: Elsevier; 2011. p. 55-68. Chaudhry SA, Vignarajah B, Koren G. Myasthenia gravis during pregnancy. Can Fam Physician 2012;58:1346-9. Berlit S, Tuschy B, Spaich S, Sütterlin M, Schaffelder R. Myasthenia gravis in pregnancy: A case report. Case Rep Obstet Gynecol 2012;2012:736024. Batocchi AP, Majolini L, Evoli A, Lino MM, Minisci C, Tonali P, et al. Course and treatment of myasthenia gravis during pregnancy. Neurology 1999;52:447-52. Hoff JM, Daltveit AK, Gilhus NE. Myasthenia gravis in pregnancy and birth: Identifying risk factors, optimising care. Eur J Neurol 2007;14:38-43. Hoff JM, Daltveit AK, Gilhus NE. Myasthenia gravis: Consequences for pregnancy, delivery, and the newborn. Neurology 2003;61:1362-6. Wolfe GI, Kaminski HJ, Aban IB, Minisman G, Kuo HC, Marx A, et al. Randomized trial of thymectomy in myasthenia gravis. N Engl J Med 2016;375:511-22. Djelmis J, Sostarko M, Mayer D, Ivanisevic M. Myasthenia gravis in pregnancy: Report on 69 cases. Eur J Obstet Gynecol Reprod Biol 2002;104:21-5. Dominovic- Kovacevic A, Ilic T, Vukojevic Z. Myasthenia gravis and pregnancy – Case report. Curr Top Neurol Psychiatr Relat Discip 2010;18:40-3. Gur C, Diav-Citrin O, Shechtman S, Arnon J, Ornoy A. Pregnancy outcome after first trimester exposure to corticosteroids: A prospective controlled study. Reprod Toxicol 2004;18:93-101. Park-Wyllie L, Mazzotta P, Pastuszak A, Moretti ME, Beique L, Hunnisett L, et al. Birth defects after maternal exposure to corticosteroids: Prospective cohort study and meta-analysis of epidemiological studies. Teratology 2000;62:385-92. Gaudier FL, Santiago-Delpin E, Rivera J, Gonzales Z. Pregnancy after renal transplantation. Surg Gynecol Obstet 1988;167:533-43. Armenti VT, Radomski JS, Moritz MJ, Gaughan WJ, Philips LZ, McGrory CH, et al. Report from the national transplantation pregnancy registry (NTPR): Outcomes of pregnancy after transplantation. Clin Transpl 2002; p.121-30. Goldstein LH, Dolinsky G, Greenberg R, Schaefer C, Cohen-Kerem R, Diav-Citrin O, et al. Pregnancy outcome of women exposed to azathioprine during pregnancy. Birth Defects Res A Clin Mol Teratol 2007;79:696-701. Sander DB, Wolfe GI, Benatar M, Evli A, Gilhus NE, Illa I, et al. International consensus guidelines for management of myasthenia gravis. Neurology 2016;87:419-25. Radomski JS, Ahlswede BA, Jarrell BE, Mannion J, Cater J, Moritz MJ, et al. Outcomes of 500 pregnancies in 335 female kidney, liver, and heart transplant recipients. Transplant Proc 1995;27:1089-90. Bermas BL, Hill JA. Effects of immunosuppressive drugs during pregnancy. Arthritis Rheum 1995;38:1722-32. Bar Oz B, Hackman R, Einarson T, Koren G. Pregnancy outcome after cyclosporine therapy during pregnancy: A meta-analysis. Transplantation 2001;71:1051-5. EBPG Expert Group on Renal Transplantation. European best practice guidelines for renal transplantation. Section IV: Long-term management of the transplant recipient. IV.10. Pregnancy in renal transplant recipients. Nephrol Dial Transplant 2002;17 Suppl 4:50-5. Buckley LM, Bullaboy CA, Leichtman L, Marquez M. Multiple congenital anomalies associated with weekly low-dose methotrexate treatment of the mother. Arthritis Rheum 1997;40:971-3. Donnenfeld AE, Pastuszak A, Noah JS, Schick B, Rose NC, Koren G, et al. Methotrexate exposure prior to and during pregnancy. Teratology 1994;49:79-81. Voulgaris E, Pentheroudakis G, Pavlidis N. Cancer and pregnancy: A comprehensive review. Surg Oncol 2011;20:e175-85. Namba T, Brown SB, Grob D. Neonatal myasthenia gravis: Report of two cases and review of the literature. Pediatrics 1970;45:488-504. Heckmatt JZ, Placzek M, Thompson AH, Dubowitz V, Watson G. An unusual case of neonatal myasthenia. J Child Neurol 1987;2:63-6. Papazian O. Transient neonatal myasthenia gravis. J Child Neurol 1992;7:135-41. Bartoccioni E, Evoli A, Casali C, Scoppetta C, Tonali P, Provenzano C, et al. Neonatal myasthenia gravis: Clinical and immunological study of seven mothers and their newborn infants. J Neuroimmunol 1986;12:155-61. Riemersma S, Vincent A, Beeson D, Newland C, Hawke S, Vernet-der Garabedian B, et al. Association of arthrogryposis multiplex congenita with maternal antibodies inhibiting fetal acetylcholine receptor function. J Clin Invest 1996;98:2358-63. Daskalakis GJ, Papageorgiou IS, Petrogiannis ND, Antsaklis AJ, Michalas SK. Myasthenia gravis and pregnancy. Eur J Obstet Gynecol Reprod Biol 2000;89:201-4.